​Whether its books, zines, posters, sketchnotes, or teaching resources for the classroom, our store has a range of products for teachers looking to expand their use of comics in the classroom. 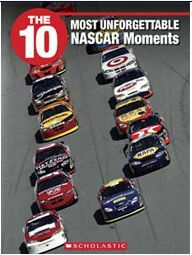 The 10 is a series of books that use a Top-10 countdown format and graphical text to explore fascinating topics from sports, science, history, pop-culture, and a wide variety of other subjects. Whether they’re exploring the ten smartest animals or the ten greatest sports showdowns, students are encouraged to engage in inquiry-based learning tasks that extend learning and discussion outside the classroom. 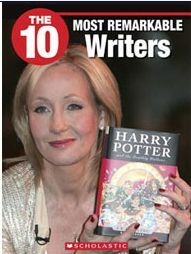 In 2009, the series received the Teachers' Choice Award for Children’s Books from Learning magazine. Here are many of the titles that I wrote for the series. Think you're smarter than your pet dog, Fido? Think again! 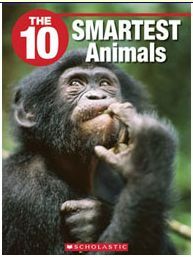 From monkeys that do math to pigs that play video games -- you'll be shocked at just how smart some animals are. What do you think it takes to win the title of world's smartest animal? History, as they say, is written by the victors. When the future of a nation and even the fate of the world can be decided on the battlefield, it's no wonder armies will do anything to come out on top. 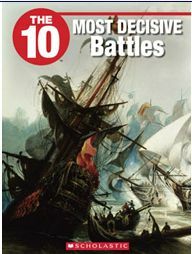 What decisive battles would you put on the list? Nothing makes more of a statement than an amazing car. From cool gadgets to luxury accessories to superhero drivers, these cars all stand out from the rest of the pack. Which car do you think is Hollywood's hottest ride? Whether they were carved in stone, written on bamboo, or woven into a belt, each of the documents in this book has played an important role in shaping our world. 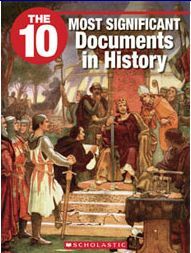 What do you think is the most significant document of all time? Many great hockey teams have been assembled over the years. From the innovators to the trail blazers to the record breakers, there have been many teams throughout hockey's history that have stood out from the rest. 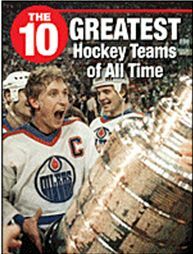 How do you pick hockey's most outstanding teams of all time? Ever since humans figured out how to fly, people have come up with all sorts of ways to take to the skies. 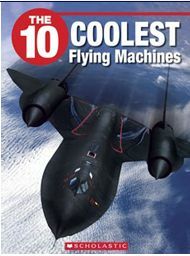 The fastest jet in the world, the fanciest jetliner ever built, the stealthiest spy plane service -- these are some of the coolest ways to fly! Which do you think is the coolest? 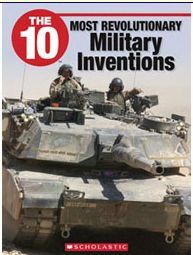 From giant bomber planes to invisible chemical and biological weapons, military inventions come in all shapes and sizes. Take a trip through time as we investigate which weapons have had the biggest impact. Which military invention really was the most revolutionary... and deadliest? From a heroic sports finale to the debut of educational programming for kids, you'll be amazed at the way TV has allowed us to experience memorable moments. Find out why these moments had people around the world on the edge of their seats. What do you think is the most memorable moment in television? High speeds, skilled drivers, and big prizes -- that's what NASCAR is all about. From a million-dollar prize to an unexpected crash, you'll find out what makes auto racing fans so passionate about this exciting sport. What is it about a NASCAR race that makes it so memorable? Welcome to the wild world of sports! 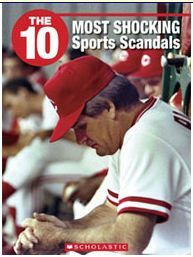 From cheating in games to bribing judges in competitions, this book ranks the shocking scandals that ruined some of the biggest names in the game. Have we made winning the only thing that matters? The stakes are high, the crowd is pumped, and tension fills the air. 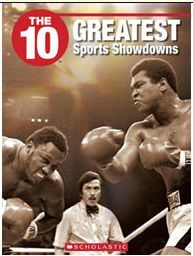 The arena is about to turn into a battlefield as we relive the 10 greatest sports showdowns. Are you ready to face some of the fiercest competitors in sports history? From tales of Middle-Earth to moving poems, exceptional writers have wowed us with their incredible talents. Find out how each of these 10 remarkable writers made their mark on the literary world. Who is the most remarkable writer? For more information on "The 10" click the button below! This website wouldn't be possible without the support of its users. 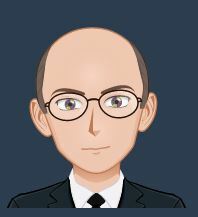 Since it's inception in 2014, the site has seen more than 2,000,000 hits, and its numerous articles and blogs have helped to support the research and pedagogical practice of comics in the classroom. If you have used the site and would like to help support it, please consider a small donation. 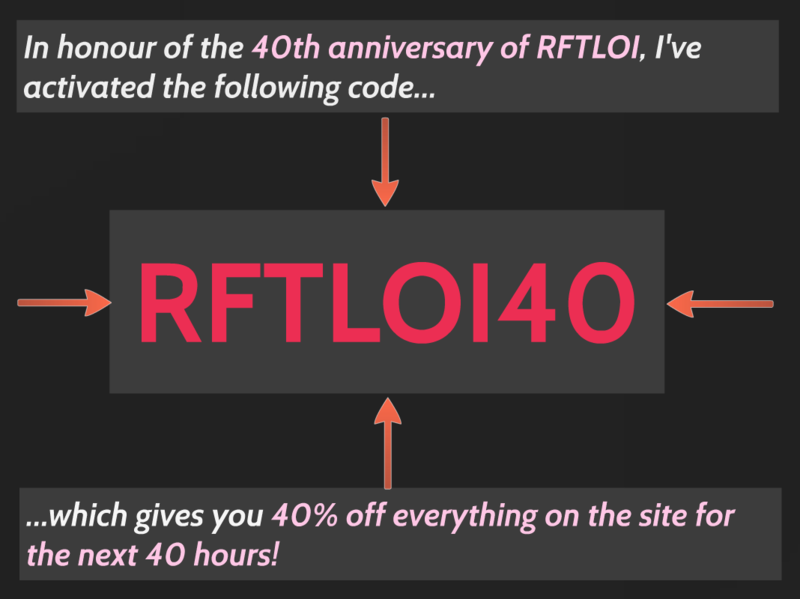 Thank you for your support, and please continue to enjoy everything that the site has to offer. 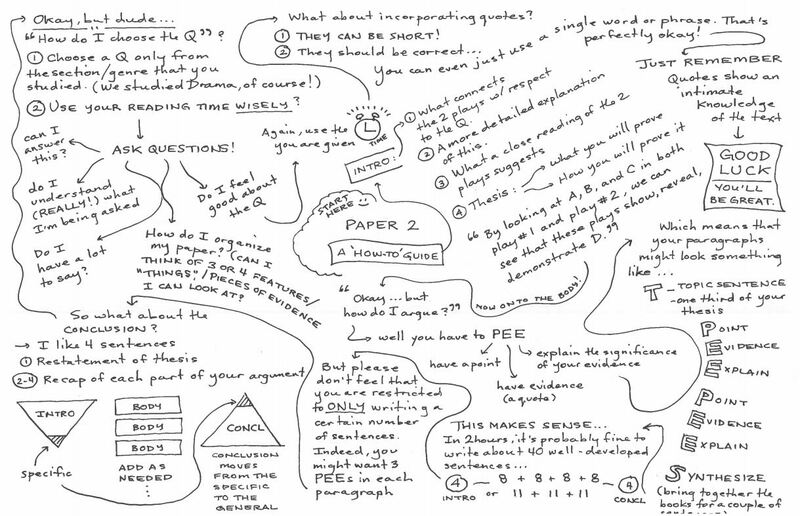 Sketchnoting the IB Paper 2 Outline! Got an exam? Try this approach! Sketchnotes are cool. You only need to look through examples of visible thinking, visual brainstorming, and sketchnoting on this site to see that they can be pretty useful. 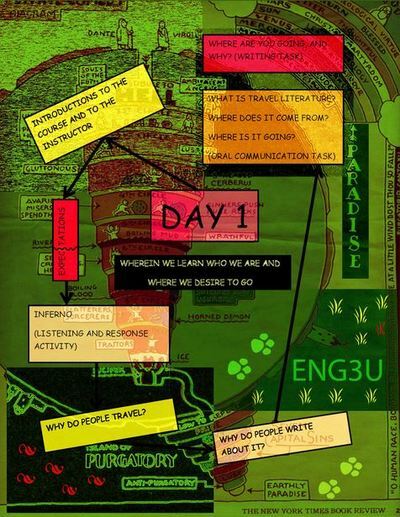 So, now that we're in the season of IB examinations, do you have a way of approaching your English A: Literature Exam? If you don't, you might consider having a look at the above sketchnote. Begin in the centre and then make your way around. If you keep these things in mind as you're writing your exam, you should have a decent opportunity to do well. More to the point, however. If you are making notes for any of your exams, try for a minute to let go of your inhibitions and just put down the first thing that comes to mind. Sketchnoting is a great way of leveraging the power of comics, doodling, and visual narrative to create something that reflects what you're thinking. As you can see in the above example, I actually drew very little, but the arrows and the small diagrams are helpful in allow the reader to visualize things. 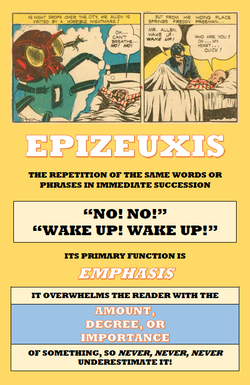 Hope this helps you as you prepare for your English A: Literature Paper 2 exam! ...feel free to contact us at Comics in Education! If I had a dollar for every time I’ve heard someone say that “Comics aren’t real literature,” I’d have enough money to get a photo with my favorite celebrity at a decent-sized comics convention. I figure I’ve heard it said about a hundred times over the course of my career, and that should be plenty for the photo, unless I wanted one with Mark Hamill and James Earl Jones, and hell, who wouldn’t pony up the extra for that? Now I know you’re probably thinking that this is going to be an article in which my Ph.D. in English and I prove how comics really are literature and that people who say otherwise are stupid. I think I’m actually going to do something more useful, which is to show that the entire discussion is stupid. I think it’s safe to say that if this is what people mean when they say “Comics aren’t real literature,” they have more problems than you or I can help them with. Anyone who has ever read a comic should realize that comics aren’t people and can’t pretend to be things. Again, neither you nor I is equipped to deal with such a person. I absolutely agree that comics are comics. This is true by definition, and I think you’d have to be pretty dim to argue otherwise. I also agree that real literature is real literature whatever “real literature” means. Unfortunately, however, that’s all that the statement manages to prove. 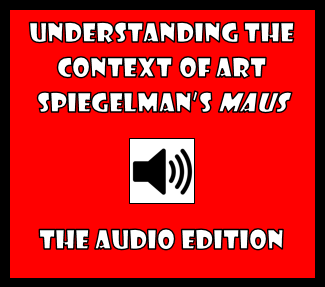 Comics are usually comprised of art, with or without text, arranged in sequence. As such, they are different from plays, novels, or essays. The latter, however, have their own unique characteristics which make them different from one another. Do you know what the above statement doesn’t really prove, though? Whether or not comics themselves are or are not literature. 6. "Comics might technically be “literature,” but they’re not real literature. " You know what…I’m not sure that people who say this actually believe that comics are literature. They use that word “technically” and it leads me to believe they’re being disingenuous. More than that, however, I’m intrigued about the difference between “literature” and “real literature.” I’ll bet you dollars to donuts that they can’t properly articulate the difference between these expressions either. Now, I love Ogden Nash and I don’t believe he’d mind my thinking that his poem is just a little bit silly despite the fact that it’s occupied the hallowed pages of The Norton Anthology of Poetry. In fact, if you think for a moment about what it’s saying, “silly” is perhaps flattering by today’s standards. On the other hand, when I read Alan Moore and Dave Gibbons’ Watchmen I don’t find it silly, nor would I feel comfortable telling Sarah Leavitt or Alison Bechdel that they were being silly in Tangles or Fun Home for sharing their very personal stories in comic form. I know that The Joker often acts quite silly, but there’s something about him—his consistent lack of motive—that is anything but silly. I don’t often see this quality in other characters, although Shakespeare’s Iago has been offered by some as a point of comparison. I think the point of all of this is that those who say “Comics aren’t real literature” don’t really understand how ridiculous such a statement is. I suppose I don’t mind it as much when people say “Comics are real literature,” although I can’t help but wonder whether they know what they’re talking about either. Comics are a form of artistic expression that (usually) comprises both the textual and the visual, and so focusing only on the former leads to people doing silly things, like overlooking Jillian Tamaki for a Governor General’s Award for the graphic novel, Skim, because she “only” illustrated it. For some, it’s easier, more comfortable even, to deal in absolutes. And, as we all well know, only a Sith does that. …or to at least become more interesting. There are many reasons why Margaret Atwood is awesome, not the least of which is her poetry. I've taught it many times and have had great success with it, especially when it comes to having students connect with it. A great example, that I've shared in the past, can be found in a previous post, "Margaret Atwood, Comics, and the Awakened Imagination." When we take a look at this little visible thinking exercise, I think there's a lot we can take away from it. 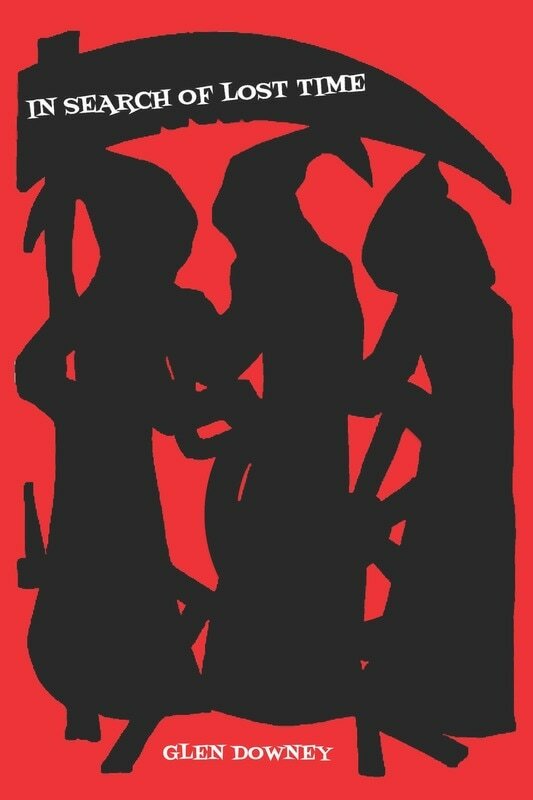 I've always loved reading Atwood because of her preoccupation with the strange and delightfully odd nature of seemingly mundane things. That's what a great poet does--they think about these things. Then, they let their gift with words do the rest. When it comes to writing a graphic novel, look for inspiration from stories that have gone untold. A great source of such stories is history, but the history for which we don't necessarily know the whole story. When I was writing Final Voyage for the Boldprint Graphic Novel series, I was trying to think of such a story when I stumbled upon an explorer I remembered studying in my youth: John Cabot, aka Giovanni Caboto. I remember learning when I was just a little guy that Cabot had sailed the ocean blue in 1497 and discovered eastern Canada. However, I don't remember us ever talking about his second, and final, voyage. In 1498 he headed out again, but this time he didn't come back to receive the adulation of England's King Henry like he did after his first voyage. This time, he and his men were lost. Writing a graphic novel about an historical event for which we don't have many of the answers is sometimes just the sort of thing we need to push through writer's block and get back on track. Having part of the narrative gives us some place to start, and while this is being established there is time to fill in the gaps and work out what might have been. Anything that allows us to be productive while we're working out the story can't be all that bad. "This book offers an approach to developing what educators have traditionally thought of as a `timetable' that is appropriate for 21st-century, independent, K-12 institutions in Canada. It suggests that timetabling as we currently understand it is insufficient in meeting the needs of learners, primarily because traditional timetables are inconsistent with existing pedagogical philosophies about teaching, learning, and curriculum delivery that are shaping the way these processes are changing in our schools." The book is being released in advance of the CAIS Project 2051 reunion and National Leaders Conference, both of which take place in Montreal later this week. For those interested in ordering the book, it is available exclusively through our store. Give students an agenda to stare at! The next time you want to put together an agenda for your students or a lesson plan, consider a new way of thinking about how this information is shared. A neat thing to do is to bring the visual to the experience so that what the students are learning looks as exciting as how you'll hope they find it. 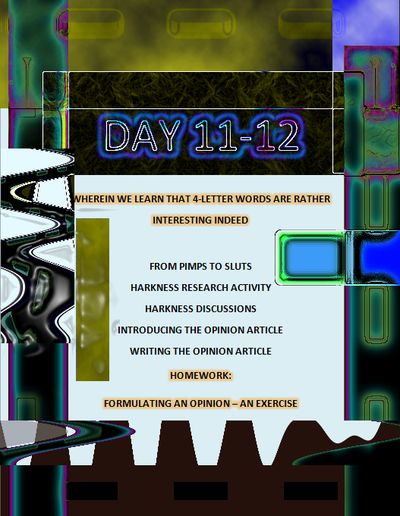 The lesson overviews above might look complicated, but the combination of a set template and using some of the features of Photoshop Elements allowed me to produce them in very little time. What they say to the student, especially at the outset of the year, is that your course is different from others that they might be taking: that the expectations are high and that you want them to think in different and creative ways. If you want a fuller explanation of how lesson plans, overviews, or agendas can be put together in the manner I've described, please feel free to use the contact button below to get in touch! Six months and 23 books later, I've managed to find a few moments to post to ​Comics in Education. Thanks so much for those who have been in touch in the interim, and hopefully I'll have some time to bring you some of the exciting things that are happening in the world of visual narrative. 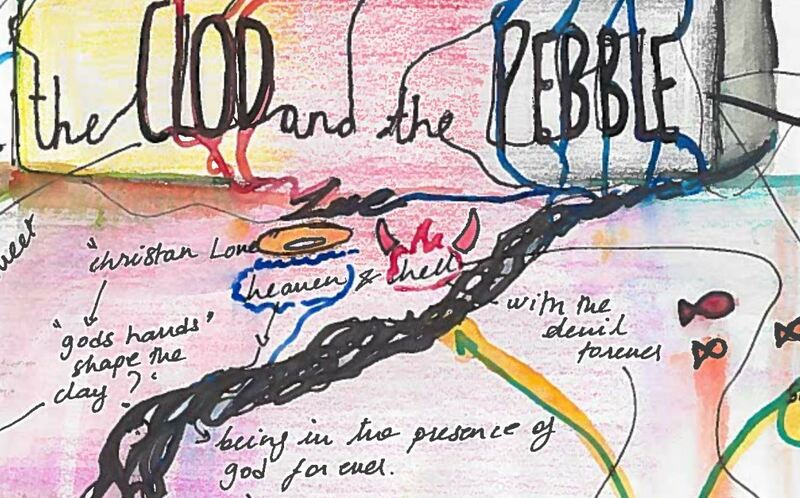 It's always nice to start with what's being produced by young people, and to that end, here comes a brilliant sketchnote put together by Pooja Devnani, a talented young artist and thinker who's taken "The Clod and the Pebble" by William Blake and run with it. Sketchnoting provides students with such a great opportunity to express their ideas in a way that makes sense to them. Some students simply want to write, others want to draw, and still others are far more comfortable mediating between the two. But look what happens when you zoom in for a closer look. It's not simply in the visual beauty of the sketchnote that Pooja makes meaning, but in the minutest details, from the connections among the various ideas to the Christian iconography to the interplay between the two. 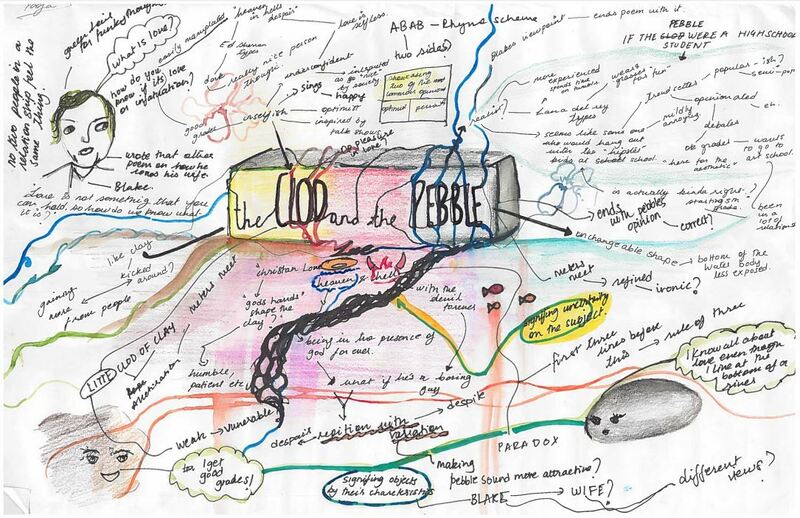 When such time and care is put into a sketchnote like this, it simply allows for a greater rumination on the part of the student on the poetry being examined. Thinking is beautiful. Sketchnoting teaches us this. 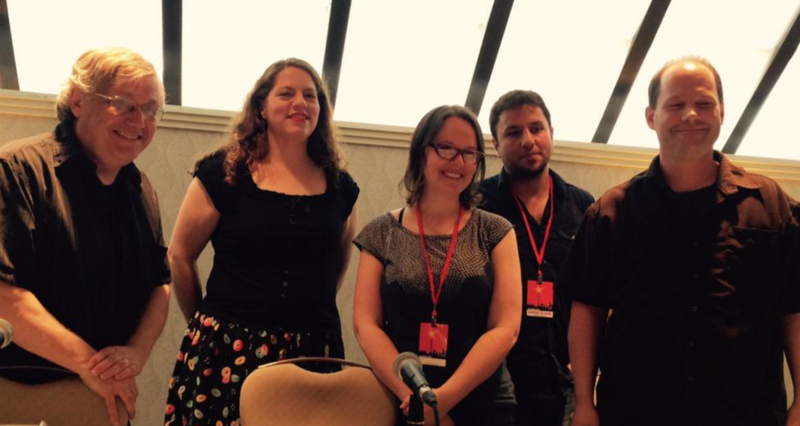 #TCAF Presentation -- The Top 10 Strategies for Teaching Comics! Thanks to everyone who came out. Here is the presentation and a helpful workshop package! Thanks so much for everyone who came out today. 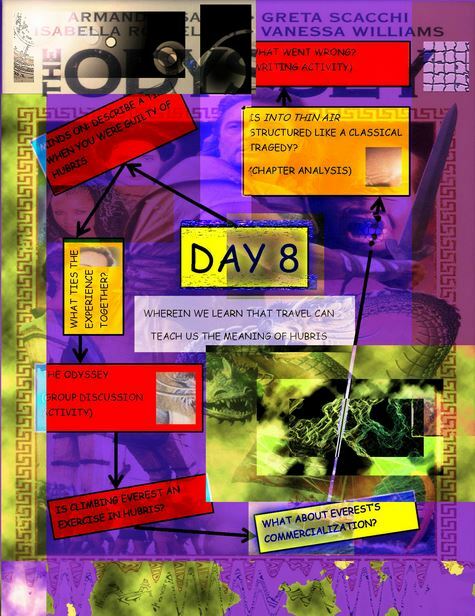 As promised, here is the Prezi as well as a handout just for all you teachers out there! Remember, if you're interested in continuing our discussion, just get in touch with me through the contact tab. Enjoy the rest of TCAF! #CITE2016 -- The "Making Media Matter" Presentations! I thoroughly enjoyed my time this past weekend at CITE 2016, the annual meeting of the Conference of Independent Teachers of English. For those of you who attended my sessions, and for those of you who didn't but are interested in the material, here are the Prezis for your viewing pleasure! A new issue of Martian Comics -- "The Canals of Earth" -- is coming your way in an exciting courtesy of new Kickstarter! Before you do anything, check out the video above and then lend your support to Julian Darius and Kevin Thurman's exciting new addition to the series. Why Martian Comics? What was your original motivation for the series? Kevin Thurman, my co-writer, had an idea for a story, and we'd talked about it in several iterations. He revised it again, tying it to the sci-fi backstory I'd created for the publisher Martian Lit! So from there, I was locked into the concept, and I felt invested in it. And it just snowballed from there. But I love the title "Martian Comics!" It's such a throwback to things like Adventure Comics or Action Comics. And I meant that title as a kind of umbrella designation, indicating that we're building a universe here that's bigger than any single story. ​What does "The Canals of Earth" bring to the series? ​"The Canals of Earth" is the story of the early days of Mars-Earth relations. Most of it is a flashback, as we watch ancient Martians looking towards Earth and imagining a Martian goddess named Earth, the same way humans once imagined a god named Mars. We also see Martian science-fiction, in which Earth is imagined as a very Martian-like society, but more advanced and eager to invade Mars. This science fiction evolves. And we track the whole relationship through the Martian space age. In terms of the larger series, this story occurs thousands of years prior to almost anything we've seen so far. Martian Comics is simultaneously running "The Girl from Mars" and these other stories. Those stories are part of a large short story collection. "The Canals of Earth" would be a very early story in that collection, in which we see Mars-Earth relations grow and change over millennia (and see lots of other stuff evolve too!). "The Canals of Earth" does give us our earliest depiction of Martian society, a glimpse of early Martian religion, and reference to a Martian city we've never seen before. We're building something big. But you can enjoy "The Canals of Earth" without any previous knowledge! It's just a good sci-fi story. What does the sophisticated reader take away from Martian Comics? What are you hoping they take away? First, I just hope that people like the issue and enjoy the story. I think the art's beautiful, and the writing is beautiful, and if someone enjoys it, that's enough for me! Second, I hope that people take away a kind of mind-bending way of imagining a very foreign perspective. We're not on Earth in this story. We're looking at how Mars has seen and imagined Earth. We're decentralized. And we're seeing Martians imagine that people on Earth would look like them. We're seeing how Martian science-fiction is a projection of Martian anxieties, and it's laughable but wonderful, in that old-school sci-fi way. Readers might be tempted to study the history of science-fiction after this issue! But I like this idea of a totally decentralized story, in which we're seeing a parallel of our own history but through alien eyes, and the entire story is this sort of distorted mirror that puts our own anthropocentric tendencies in stark relief. And maybe, just maybe, through that, some readers might see a parable of our own anthropocentrism and the need to imagine other perspectives! Maybe. In any case, there are things to think about here, places for the readers' brains to go! And I like giving readers these experiences, and seeing what they think about, which is never exactly what I'd think about -- and that's great! Third, on a more meta level, I hope the sophisticated reader sees a comic that demonstrates that comics can do this -- make people think. So many of the comics that have most affected me were intelligent. Certainly, the truly classics are. And I think you can be intelligent and entertaining at the same time. But I think that there's a perception that most of the smart comics being made are autobiographical or "non-genre," whereas the genre work tends to be flashy but a little thoughtless. Martian Comics is here to say, "No, you can do smart -- even really smart -- sci-fi comics that are still sci-fi, and unembarrassed about their genre, and fun!" "The Canals of Earth," in particular, really reminds me of some issues of Planetary, which was intelligent and played with genre and had the same sort of mix of smart fun. Comics can do this. We know that. And we need to get back to it. Where do you see the series going from here? Everywhere. I'm in it for the long haul. We'll be continuing with "The Girl from Mars" and these other Martian stories for a while yet. We'll be getting out collected editions. Eventually, these other stories, like "The Canals of Earth," are going to be a massive volume spanning thousands of years, with different cultures and characters and historical trends being explored in a really sprawling way. I've got other ideas, other volumes, stories I want to tell. There's a very long-term plan here. We may only be on issue #5, but I'm currently writing a story that'll probably be in issue #13, and I've got plans for many dozens of issues' worth of material after that. What do you think is the most compelling reason for readers of Comics in Education, or fans of comics in general, to support your Kickstarter campaign? ​Because comics can do this. They can tell ambitious stories that can only be told in comics. Reading for the Love of It -- Resource Central! As promised, here are the resources from my two presentations. First up is "Best Class Ever!" 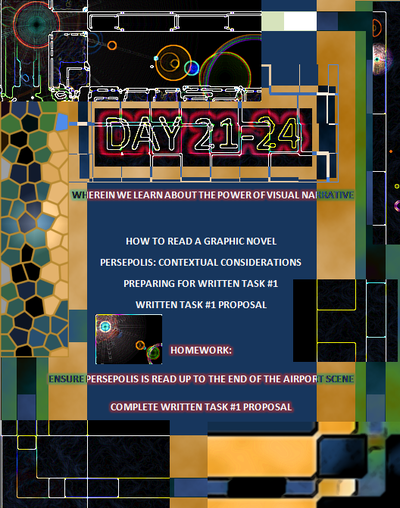 In addition to the Prezi, I'm including the workshop handout and the workshop package! Check out the Workshop Package. Pages and pages of resources and ideas! Hi everyone! Just a quick note to let you know that I'll be presenting this coming week at Reading for the Love of It at the Sheraton Hotel in Downtown Toronto! This year's conference is the 40th anniversary of the event and it should prove to be a wonderful opportunity for educators to gather and share their stories. Here are the places where you can catch my presentations! Gathered, collected, honed, and refined over the course of two decades in secondary and postsecondary education, the activities presented in this workshop are guaranteed to have your students coming up to you afterwards and saying, “Best class ever!” Whether it’s an activity based on a popular game show that brings out our passion for literature, a unit on World Mythologies that uses the framework of reality TV, or a hilarious poetry activity that sees students marry human emotions with mundane objects, participants will get a fist-hand look at some phenomenal classroom activities by getting right in there and having a blast doing them! Participants looking for a fun, activities-based workshop that can be taken directly back to the classroom need look no further. Despite having its detractors who complain about the long lines, expensive photo ops, and last-minute cancellations attendant with cons, Toronto Fan Expo 2015 was one hell of a good time. Let's face it...if you take that many nerds and put them in any kind of building, you're violating the principles of common sense. You're also bound to have a group of people that are friendly, fun to be around, and generally awesome. This was a great session and I think I enjoyed it even more than the Hogwarts reunion on the Saturday evening. James and Oliver are charismatic dudes and had all of the floor time. The crowd loved them and asked them a broad assortment of questions ranging from thoughtful to downright goofy. But that's what fans do. 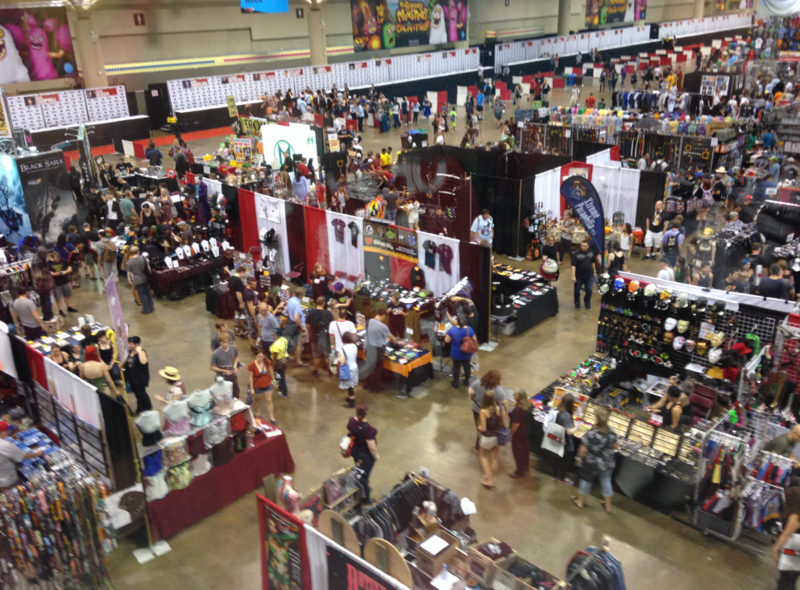 If you only went to FanExpo on Saturday or Sunday and the crowds drove you mental, consider coming on Thursday next year. This birds-eye shot from the overlook shows that there is plenty of room for you to check out the North building. Not only that, but minutes later my family and I were sitting down at a table having pizza for dinner. That's right, we were actually sitting at a table! I don't know what motivates someone to spend a warm Sunday afternoon at a crowded Fan Expo convention sweating inside a Sauron costume, but this stood out as a highlight when it came to the great costumes being worn this year. I mean, when you have children who love everything to do with Lord of the Rings, and, most especially, the villains, then you can't get any better than running into this guy. Fortunately, his infernal graciousness was kind enough to pose for a couple of photographs just between the food court and Artists Alley before taking a couple of steps and being asked by someone else for a photo. Such is the price when you're the Dark Lord. All in all, the show was once again a tremendous success. Despite being packed on the weekend and despite some of the strange ways we're lined up for events, the people in attendance are the ones who make the event -- kind, considerate, and respectful people who just want to nerd out with one another at the end of the summer each year. Wall-E Meets Calvin & Hobbes: Introducing the Adventures of Whiz Bang, the Boy Robot! This first full-colored volume contains the longer story of Whiz Bang and Amelia along with 2-3 short, stand-alone comic stories geared for an all-ages audience – especially emerging readers ages 4-7 that will enable readers to easily pick up any issue and follow along without facing the difficulties of continuity. Later volumes will include a continuation of this story along with additional short stories about Whiz Bang, Amelia, and later friends we haven’t met yet! The book is already getting a lot of buzz, with an article on Bleeding Cool coming out yesterday. If you'd like to check out some of the sample pages, you can find them on the Issuu website. Take a moment to check out the publisher as well: Under Belly Comics. Supporting this project shouldn't require much deliberation. It's a no-brainer. You can see that parents, educators, and members of the comics community feel the same way from the wonderful support it's already received. Simply put, it's a beautiful book for kids. Thanks to all of you who came out to my workshops at the CITE Conference today. Great hosting by the CITE executive and the wonderful folks at Hillfield-Strathallan College. Please click on the link below to retrieve the PowerPoint for my second session, "Literary Terms We Never Teach Our Students." For those of you who want to check out the Prezi from the third session, "The Art of Visible Thinking," I've embedded it below. Thanks again to everyone who made it out! If you want to get in touch, please email me or get in touch through a contact form! William Carlos Williams' "The Red Wheelbarrow" is a cool little poem to visually brainstorm with a visible thinking activity like sketchnoting. What's even cooler is to get a whole class engaged in putting together their own sketchnotes on the same poem and then taking a look at the final results, either with an installation that's spread across the classroom bulletin boards, a repository of the scanned doodles saved as a Google doc, or the completed sketchnotes tweeted out for all to see. Williams was influenced by so many different developments that were happening not just in American poetry but throughout the visual and performing arts. Looking at what he, Stevens, cummings, H.D., and Stein were doing in those first three decades of the 20th-century shows just how impactful someone like Pablo Picasso was on the development of their writing. One has no idea what someone like William Carlos Williams would have thought about visual brainstorming, visible thinking, or sketchnotes, but something tells me that he and others like him would have been rather fond of the practice! Although away on a short hiatus for a couple of days, I still got up to some doodling -- this time about a subject I know pretty well: the history of chess in literature. This visible thinking sketchnote is actually pretty linear, moving from the centre down the right hand side of the page, and then hanging around the bottom before it moves upward. Of course, it can be read in any different number of ways, but the way I've suggested allows the reader / viewer to trace the historical progression. The study of games in literature is known as the field of ludology, which served as the focus of my Ph.D. I think visible thinking and sketchnoting are pretty natural for someone who looks at games, play, and sport under the larger umbrella of motif studies. It's an area in which constantly drawing rich connections is vitally important. Hope you're enjoying the Visible Thinking Project, and let me know if you'd like your own work featured on the site! My first graphic novel, Fire Mountain, has a kind of a neat story that goes along with it. While homeschooling our son, Will, we found that he had developed a pretty strong fascination with ancient Rome, and more specifically, the destruction of Pompeii by Mount Vesuvius in 79 CE. Well, lo and behold, the Canadian Museum of History in Ottawa/Hull just happened to be having an exhibition of the plaster casts made by Giuseppe Fiorelli who, in 1863, discovered that air pockets left in the layer of ash covering Pompeii were left by decomposed bodies. This encouraged him to inject plaster into the voids and recreate the death throes of those who perished when Vesuvius erupted. There was no question about whether or not we were going to see the casts. When a child is being homeschooled and the very thing he loves to read about is going to be on display in a museum, you really have to get to that museum even if it hadn't originally been in the holiday forecast. When we got back from our trip, he couldn't stop drawing temples and ruins and gladiators and just about everything else "Ancient Roman" he could draw. The whole time he was telling me that I should write a book about Pompeii and that he'd draw the pictures. As luck would have it, I was asked shortly after our return to write for a new series of graphic novels called Timeline produced by Rubicon Publishing in Oakville for Scholastic Canada. I already knew the title of the first book I would write and I also knew a certain eight-year old that would be drawing up a storm when he knew what I'd be doing. The book became Fire Mountain, and was illustrated by Liam Thurston for Rubicon/Scholastic. It shows, I think, how a young child can be genuinely inspired when homeschooling allows for genuine, self-directed learning, and how the child's excitement about his own learning experiences can subsequently inspire others around him.